Your favorite band could release a new CD with the most original and appealing cover ever designed but it wouldn’t matter one iota if the music on the disc sounded like crap. What’s on the inside...matters the most. The same applies to your health. Don’t equate health with how you or others appear on the outside. You could look great but not be very healthy. For instance, when I worked in the corporate world one of my co-workers seemed to be totally fit. He was a competitive soccer player and exercised regularly. However his eating habits weren’t exactly the greatest. 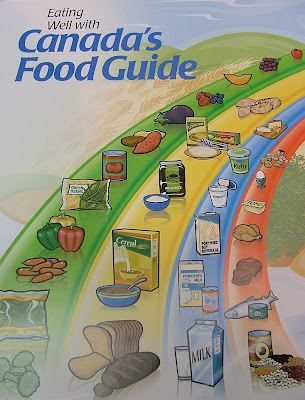 One day I was surprised to find Canada's Food Guide chart posted on his cubicle wall. I asked him why he put it up and his response was his doctor strongly suggested he should. You see, even though he appeared fit, he had high blood pressure. It wasn’t life threatening but serious enough for his doctor to suggest he start taking care of himself on the inside by making smart food choices. If you want to improve your inner workings always be mindful of what you cook and eat. Smart daily food choices paired with regular exercise will have you looking stunning on the inside with a healthy glow on the outside! What’s stopping you from looking after what’s on the inside?